Weeknight dinners. Humpf. Actually most dinners lately. It's tough to not be making two different meals with toddlers whose utensil skills are questionable. Sometimes we all eat the same thing but often times it’s a different version of the same thing. Maybe taco salad for Hugh and I but those goods wrapped in a tortilla for the kids. Cleo just absolutely destroys anything in her path so it doesn’t really matter what form I give it to her. Half will be on the floor (some by default and some intentionally thrown), most certainly clumps in her hair and hopefully enough food in her belly to satisfy. I see how many of you respond to the feeding babies posts and I want to be better about giving you weeknight dinner ideas. I’m bad at it too, hence why there aren’t many here. But as a friend told me as we were talking shop recently, (paraphrased) “there are so so many food blogs and cookbooks now, you need to help people solve a problem.” So I thought of my problem, ironic as it may seem given what I do for work, and what seems may be your occasional problem as well. What are we making for dinner that is wholesome and quick-ish? I’m not of the camp that sells “quick cooking”. I think the recipes I write are pretty simple, but I don’t over sell them as such because I think the process is part of eating well. You don’t get great or even good food without putting in some effort, sorry. People who are selling you otherwise are fooling you. We have to eat. Whole foods keep us feeling well. Yes, everyone is short on time for one reason or another but real food sustains us. It is wellness and community and conversation and necessity - those things don’t always come fast. Maybe they aren’t a homemade croissant whose process spans over two days or a beautiful “buddha bowl” with 8 different recipes within a recipe, those things feed creativity and help us enjoy the art of cooking but they are not peoples everyday regardless of what Instagram leads you to believe. So let's shoot to get dinner on the table - something fresh and at least one vegetable. It is a responsibility and it is not always beautiful but we’re doing the work and that matters. This one pan meal is a great weeknight dinner. I love that it makes enough for leftovers too and for the kids, I wrap it up in a soft tortilla because apparently that’s my answer for anything they may push back on. “It’s a burrito, you guys!” You could even replace the chickpeas with shredded rotisserie chicken and it’d be whole30 and paleo and all that. Warm, well spiced, just creamy enough, under 30 minutes and wholesome - I really like it. So, Greenpan is celebrating their 10-year anniversary and brought on a few bloggers to share recipes using their cookware. 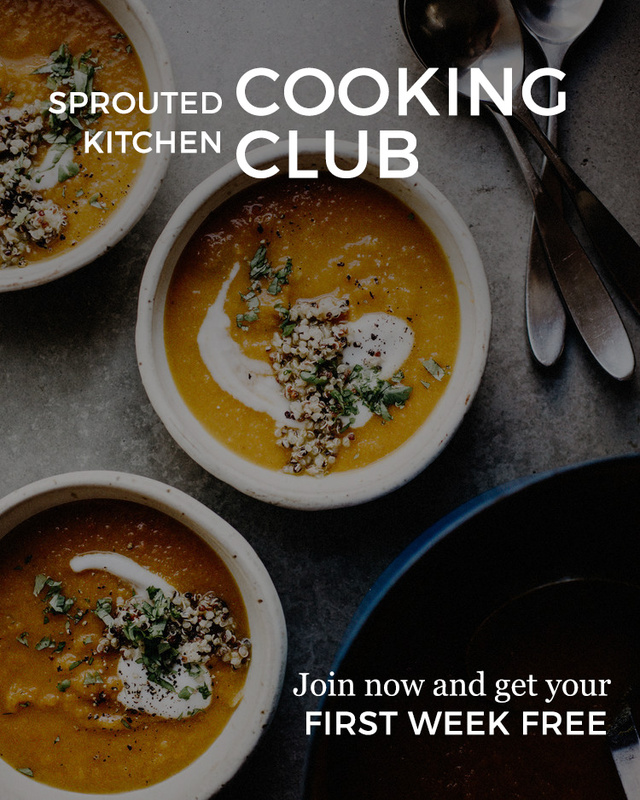 I’ll be sharing another great meal recipe with their products next week as well (we’re doing it!). Traditional non-stick pans are coated with PTFE and PFOA which release toxic compounds once overheated. They are also easily scratched which makes matters even worse with releasing the bad stuff. If yours are scratched, replace them! The ceramic that coats Greenpans is made from natural materials and is naturally nonstick so you can get away with using less oil and butter without food sticking. I use a combination of stainless, cast-iron, and certain foods in non-stick pans. You don’t get as much of a sear or color on foods in the later, but you also don’t have to use as much fat to cook with. This pan has been my morning workhorse for eggs and pancakes. Plus you certainly can’t beat the clean up. Thank you for supporting me and this site in doing sponsored work so we can continue doing the work we love here. Most curry blends already have cumin and coriander in them but they vary widely on heat factor. If yours is not super spicy, you can just use more, but exclusively curry powder. If yours is on the warmer side, I’d follow the spice yields below. 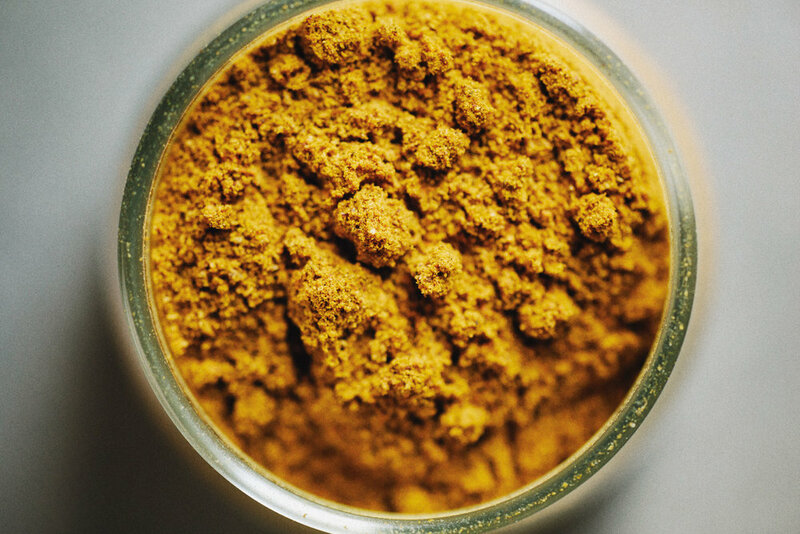 As a general rule, sweetness cools down too much spiciness as will the yogurt topping, but most store-bought curry powders are pretty mild. 2 cups greens, such as spinach, chard, baby kale etc. * Cauliflower rice comes “pre-riced” at most stores now (Traders, Sprouts, Costco. I’m aware different stores stock different things). If yours does not, simply take one small head of cauliflower, break it into florets and pulse in your food processor until it is rice like in size. Do not over pulse and make a puree. 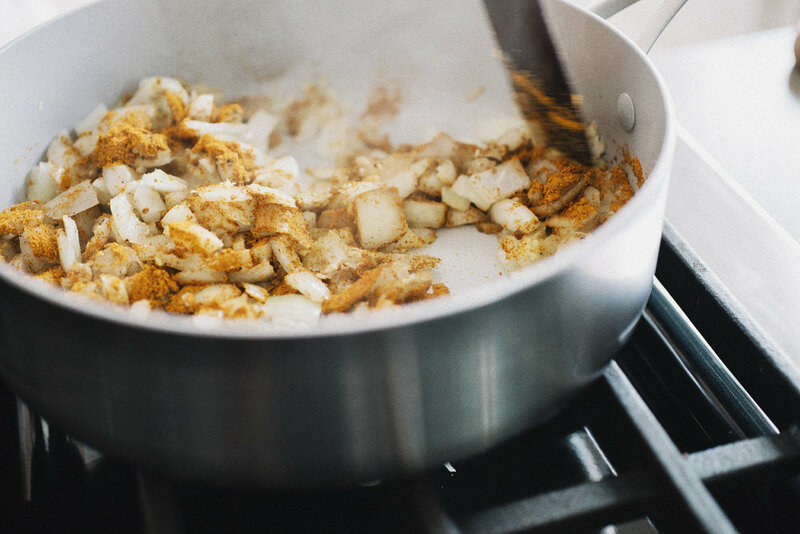 In a large saute pan over medium heat, warm the coconut oil. Add the onion and a few pinches of salt and saute until softened, about 5-7 minutes. Add the garlic and ginger and saute another minute. Add the curry powder, cumin, coriander, another pinch of salt and stir. Add the riced cauliflower, chickpeas, stock, raisins and stir until the cauliflower is softened. About 5 minutes. Fold in the greens and let them wilt slightly and then stir in the coconut milk. I like a stew-ish consistency with this, you can use less if you want it drier, or the entire can of coconut milk if you want more broth. Serve the bowls with a dollop of plain yogurt, green onions, cilantro and toasted cashews.